July 29th, 2015 | Moving Tips. When it comes to moving, many people think about removing bubble wrap, cleaning carpets, and giving the interior a fresh coat of paint. However, many people overlook the outside of their new home. You want the exterior of your property to look as good as the inside. After all, this house is yours, so why not make the landscaping yours as well? Make your new landscape fit your style and personality with these five tips. If you buy a previously owned home, the former homeowners represent a great resource for learning about the landscape. Ask them about the kinds of plants or flowers that they’ve planted and had success with. If you inherit some of their trees, bushes, or other plants and you want to keep them, ask the owners how to care for the foliage. You might have to say goodbye to that oak tree in your old backyard, but relocating smaller plants doesn’t usually present much of a problem. However, make sure you can legally move your plants to a new location-especially if you move to another state. For example, some states might prohibit transplanting out-of-state plants to control disease, insects, and other plant-related issues. Once you’ve determined that you can move your plants, give them a good drink of water so the roots don’t dry out. Then remove some of the leaves and stems to make for easy transportation as well as reduce the shock of moving. Dig a circle at an angle around your plant, cleanly cutting off the roots. Then take the plant out of the ground and wrap it in burlap or put it in a pot. Relocating your plants is always a risk because your plants might die of shock when you transplant them. To avoid this problem, try to move your plants in the winter when they are dormant. Before you start doing anything to your yard, check it for potential problems. If you have pets or children, you need to make sure there are no holes in fences, loose boards, or any other dangers. If the previous owners did some landscaping, make sure the trees and other plants are in good condition. Any rotted, infested, or otherwise damaged trees might pose a problem later on. You might also want to have the soil tested to see what kind of nutrients it contains. The test will help you determine what you can plant there and whether your soil needs any help before you start planting. 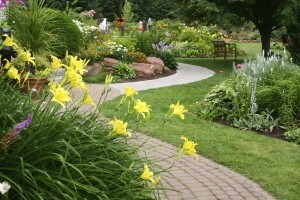 Once your yard lacks obvious problems, you can start planning what kind of a landscape you’d like to create. Make sure that there aren’t any restrictions you need to follow. Some neighborhoods or states might prohibit certain fences, trees, or yard decorations. Also, find where the sewer or water lines lie so you don’t risk cracking them. You don’t want to plant anything where water can’t reach or put a picnic table right by a sprinkler either. Draw a diagram that shows where the water sources are. Add other features to your diagram, including where the sun and shade will be. Additionally, do you want a cobblestone path, a fishpond, or a garden? By mapping out what you want and where it will go, you can have a realistic idea of what you can do to your landscape. You don’t need to create your new landscape overnight. Just as it takes time to unpack and set up your new home, it takes time to get your yard the way that you want it. Pace yourself – you’ve moved to a new area, so you don’t know what the seasons are like. It doesn’t matter if the landscaping process takes two months or a year. Once you have a plan, you can start gathering materials and tools and then get to work personalizing your new yard. Our moving and planning guides can help you prepare your plan and make your relocation process go smoothly.